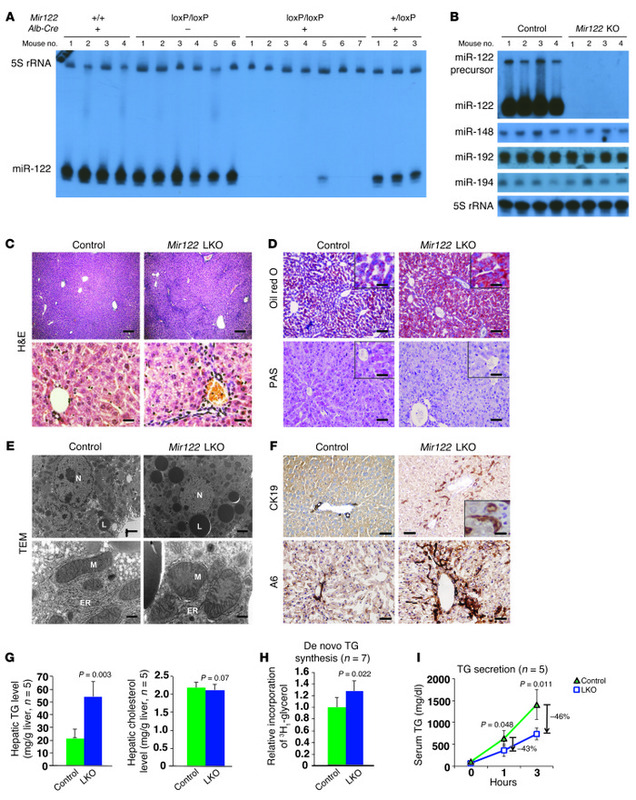 Abnormal liver structure and TG metabolism in Mir122-LKO mice in early adult life. (A and B) Northern blot analysis of miRNA levels in liver. (C) Representative liver sections of 8-week-old control (floxed) and LKO mice after overnight fasting (n = 8–10 mice per genotype). Scale bars: top row, 200 μm; bottom row, 25 μm. (D) Oil red O– and PAS-stained liver sections from 8-week-old LKO mice after overnight fasting (n = 5 per genotype). Scale bars: top row, 100 μm; bottom row, 100 μm; insets, 25 μm. (E) Transmission electron micrographs of liver sections from 12-week-old LKO mice. Lipid droplets (L), ER, mitochondria (M), and nucleus (N) are labeled. Scale bars: top row, 2 μm; bottom row, 450 nm. (F) CK19 and A6 staining of bile duct and oval cells, respectively, in LKO livers (n = 3 mice per genotype). Scale bars: top row, 100 μm; inset, 5 μm; bottom row, 25 μm. (G) Hepatic TG and cholesterol levels in 10-week-old LKO mice. (H) De novo TG synthesis in liver as measured by 3H1-glycerol incorporation. (I) TG secretion as measured by monitoring serum TG levels after administration of Triton WR-1339. The results presented in G–I are mean ± SD. Statistical significance was calculated using a 2-tailed t test.